Just back from Paris GDC, and while there was a number of cool things there, my favorite was the keynote given by the guys at Media Molecule, makers of Little Big Planet. You can find plenty of summaries of their talk online. No need to rehash here. What I did want to note though, is that they seriously raised the bar for those of us looking to given good, unique, presentations. Rather than using Powerpoint, their entire presentation was done as an in-game level, which they "played through" as they gave their talk. Different videos and pix were brought up by leaping onto trigger switches, levers and buttons were used to trigger animated actions supporting the talk, etc. Maybe I'll give my next talk in Line Rider! Everyone is going to link to this. It's just too awesome not to. Wealthy guy in NY has his apartment remodeled, and wants to have puzzle elements built in, that his kids have to solve to get to the end prize, a poem he's written for them. The architect (game designer?) outdid himself, to say the least. 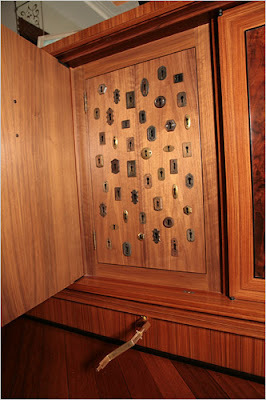 "In any case, the finale involved, in part, removing decorative door knockers from two hallway panels, which fit together to make a crank, which in turn opened hidden panels in a credenza in the dining room, which displayed multiple keys and keyholes, which, when the correct ones were used, yielded drawers containing acrylic letters and a table-size cloth imprinted with the beginnings of a crossword puzzle, the answers to which led to one of the rectangular panels lining the tiny den, which concealed a chamfered magnetic cube, which could be used to open the 24 remaining panels, revealing, in large type, the poem written by Mr. Klinsky." Be sure to look at the slideshow as well. The craftsmanship looks awesome. The latest trailer for upcoming XBLA title Go Go Break Steady is looking awesome. A peer of mine signed this title while I worked there, and it has been under development for a LONG time. I haven't seen many XBLA titles go through this much iteration (except maybe Braid, the game I'm most looking forward to), and change so much during that process. Last I played it, it was a beatmatch game with a kind of match-3 twist to it, and was cool then. I can only assume it's gotten even better. Really looking forward to it. Clowd: (via Seth Godin). Meant to refer to the idea of combining crowd-sourcing with cloud-computing. i.e. send execution out there to the 'cloud', but maybe it's crowdsourced and it's actually this amorphous human engine that executes it. I like the idea, but as a portmanteau, it's almost impossible to audibly differentiate 'clowd' from 'cloud', not to mention the confusion when it's someone with a Canadian accent pronouncing it. Visually, looks too much like 'clown'. Is it a portmanteau form of a snide jeer? If so, then it's a little too clever! This next one I love so much more. Psychogylcimic: A clever combination that clearly indicates the behavior exhibited by some when their blood sugar gets low. My wife started using this one immediately upon hearing it.